Bicycle Trailers & all that! The info on this page is all about Bike Trailers and what to look for when buying. We will try to give you as much information as possible to help you make your choice. There are numerous Bicycle Trailers out there, from cheap e-bay examples, to six hundred pound plus ‘top of the range’ examples. 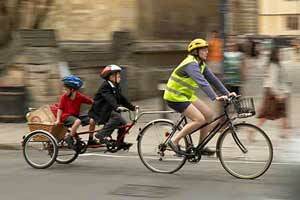 There are also many different types and methods of transporting adults and children using pedal power. What types of bicycle trailer are available? Children’s – Single seater, double seater, babies? Children’s bicycle trailers appear to be the most common type, both single and twin seater. 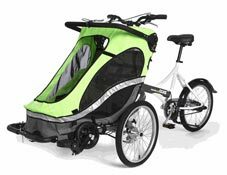 Bike trailers for babies are less common, but are available as an option with some of the more expensive trailers. Cargo – Shopping, expedition, business. Cargo trailers come in a variety of shape and sizes, from those designed to take your shopping home from the supermarket, to cycling expeditions and selling ice creams and sandwiches. Bicycle trailers can be adapted for disabled passengers, but the problem comes with exceeding the age range. There are disabled bike trailers available for older passengers, but they can be few and far between. These are normally specially built and can be expensive. Even though it would be lovely to be towed around the place, the closest application is probably a rickshaw or a tandem. Purpose – Towing, jogging, strolling, shifting. Do you just want a bike trailer for transporting the kids, or will you want to go jogging and take the kids with you? Will you want to use it as a stroller once you reach your destination? Are you going to use it to pick up the shopping? How often – regular/occasional use. The type of bicycle trailer you decide to get may depend on how often you plan to use it. A cheap one may be ideal for sunny afternoons, whilst a more expensive hard bottomed version may be more suitable for every day use. You would also need to consider the type of cover and how durable it is for all weather/year use. Where will it be used? Smooth road surfaces and tracks shouldn’t cause any problems. However, if you plan to go a bit more off road, then you would have to assess how the bike trailer and it’s fittings are going to withstand any bumps and scrapes, plus if your child likes a bit of off road. Basically this all depends on your child. The manufactures guides are normally pretty good, but some kids are taller than others? The starting age is always a bit of an issue. How young can your child be? Again it depends on the child and what the parent wants to do? Basically, as a minimum, your child should be able to sit up and happily hold their head up unsupported and be comfortable. Remember, as a parent you should make your own judgment on what is acceptable. Where you have more than two children, you can get yourself into a pickle on how you’re going to transport them all using one bike on the school run – A tandem and a trailer? What type of bike will it be fixed to? The type of bike can dictate what type of tow hitch you need to use. This is because of the different shaped tubing now used on many bikes. If the bike has disk brakes, these can fowl some types of tow hitch. How many bikes will use it? Can you easily swap the trailer from bike to bike? Do you need additional towing hitches? How easy will it be to keep it clean? Where am I going to put it when I’m not using it? How easy is it to fold it when I put it away? Will I have to let it dry before I put it away? Will it Fit in the Car? This depends on how and if the trailer dismantles, and of course, the size of your car! Please note that the information contained within these pages is for guidance only and could contain inaccuracies.